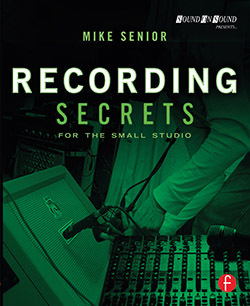 Click here to visit the 'Recording Secrets' Library Of Mic Positions! The Role Of The Room: Moving an instrument and its miking setup to a different part of the recording space, or even to a different room altogether, can substantially affect the recorded sound. For example, the following examples feature a grand piano miked with a single omnidirectional small-diaphragm condenser about two metres in front of the instrument. This setup was recorded with the instrument (and its mic) in four different locations within a fairly live-sounding, medium-sized rectangular recital hall: roughly in the middle of the hall (Ex06.001:WAV/MP3 ); towards the edge of the hall firing directly at a wall (Ex06.002:WAV/MP3 ), which emphasises the high frequencies, but at the expense of some comb-filtering artefacts; against one wall firing out into the hall (Ex06.003:WAV/MP3 ), which enhances the low frequencies on account of the boundary effect; and directly in a corner, firing out into the hall (Ex06.004:WAV/MP3 ), where the boundary-effect bass enhancement is further strengthened. The recording room also affects close-miked instruments, as you can hear in the following examples of an electric guitar cabinet recorded with a Shure SM57 close mic only 15cm from the grille: in the middle of an 18mx12mx5m recital hall (Ex06.005:WAV/MP3 ); in the middle of a small 4mx5m studio live room (Ex06.006:WAV/MP3 ); in the centre of the same studio live room, but raised 30cm off the floor on a heavy-duty podium (Ex06.007:WAV/MP3 ); and in the corner of the same live room, firing out into the room (Ex06.008:WAV/MP3 ). For some more dramatic examples, check out these great little videos: Wikidrummer & Wikisinger. The 'Tag Team' Miking Method: The diagram in Figure 6.8 of the book illustrates a real-world application of tag-team recording I used while recording cello overdubs for the band Dunning Kruger, a session I wrote about in detail in Sound On Sound magazine's February 2013 'Session Notes' column. Here are the first two guesswork mic positions I tried, which were both recorded simultaneously: Mic 1 (Ex06.009:WAV/MP3 ); Mic 2 (Ex06.010:WAV/MP3 ). Feeling that Mic 1 was more promising tonally than Mic 2 at this point, but that it was also too wet overall, I moved move Mic 2 to address the instrument from the same angle as Mic 1 (for better tone), but from closer up (for a drier sound). I then did another test recording with both mics: Mic 1 (Ex06.011:WAV/MP3 ); Mic 2 (Ex06.012:WAV/MP3 ). Mic 2 then sounded better than Mic 1, so I moved Mic 1 to the same miking distance as Mic 2, but experimented with another lateral position. At this point I ended up with two microphone signals which, while different, felt equally appealing aesthetically: Mic 1 (Ex06.013:WAV/MP3 ); Mic 2 (Ex06.014:WAV/MP3 ). High-frequency Beams & Shadows: The following examples illustrate some of the frequency beaming/shadowing issues discussed in Section 6.2.4 of the book. Because of the shadowing effects of a grand piano's lid, the sound captured in front of the instrument (Ex06.015:WAV/MP3 ) will inevitably be brighter than that heard at the rear (Ex06.016:WAV/MP3 ). Likewise, you'll also dull the sound by half-closing (Ex06.017:WAV/MP3 ) or fully closing (Ex06.018:WAV/MP3 ) the instrument's lid. Any instrument with a horn will tend to direct its high frequencies primarily on-axis to the bell, as you can hear in these very bright-sounding on-axis recordings of trumpet (Ex06.019:WAV/MP3 ) and trombone (Ex06.020:WAV/MP3 ). A similar principle applies to guitar-amp speaker cones, where you'll get the brightest tones when close-miking the centre of the cone (Ex06.021:WAV/MP3 ), and progressively rounder tones as you move the mic laterally: mic midway between the centre and the edge of the cone (Ex06.022:WAV/MP3 ); mic at the edge of the cone (Ex06.023:WAV/MP3 ). Room Resonances: Room resonances can causes certain frequencies of an instrument to dominate over others, for example in this recording of a church organ (Ex06.024:WAV/MP3 ), where the musical root note becomes a bit overbearing. In such cases, vertically repositioning the microphone a little can help achieve a more consistent registral balance without altering the fundamental timbre (Ex06.025:WAV/MP3 ). You can hear something similar occuring in this upright bass recording too (Ex06.026:WAV/MP3 ), where I suspect that the overprominent 'D' notes may be the result of a floor-to-ceiling room mode (the resonant frequency is typical of normal domestic ceiling heights) -- although it could also be attributable to the main air resonance of the instrument's body cavity, which would also typically resonate around this kind of frequency, and may have been picked up too strongly on account of a mic position too close to the instrument's soundholes. Balancing Instrument Facets: The following examples demonstrate how different close-miking positions bias the microphone's pickup in favour of different tonal facets of a given instrument. Here's a microphone by the bridge of an acoustic guitar, for instance (Ex06.030:WAV/MP3 ), where the woody sound of the instrument's body predominates and pick and string-damping noises are quite prevalent. Moving the mic directly over the instrument's soundhole (Ex06.031:WAV/MP3 ) overemphasises the instrument's air resonances as well as capturing very edgy picking noise. A mic position around the 12th fret (Ex06.032:WAV/MP3 ) manages a decent blend of the instrument's body timbre and string character, while keeping picking noise a fairly low in level. The level of the fret squeaks, however, isn't ideal, and only gets worse if the mic's repositioned further down the fretboard (Ex06.033:WAV/MP3 ), where the overall tone also becomes rather thin and jangling. To take another example, a mic placed close behind the music stand inside a grand piano (Ex06.034:WAV/MP3 ) will capture a stronger hammer-attack component, as well as more audible damper noise during quieter passages, and won't do the same justice to the lowest frequencies of the instrument's longer strings as a position more over the centre of strings (Ex06.035:WAV/MP3 ). Right at the foot of the piano (Ex06.036:WAV/MP3 ) the sound becomes much woodier, with the instrument's soundboard character taking on a more prominent role because most of the strings are further away from the mic. As a final example, check out this violin close-mic recording (Ex06.039:WAV/MP3 ), where the microphone has clearly focused too closely on the bow contact point, yielding an unpleasantly dry and scratchy sound. Spotlighting: Here's a selection of instruments recorded with identical mics at different distances, to illustrate the concept of spotlighting discussed in Section 6.2.7 of the book. In all these cases, the instrument timbre becomes more natural and well-balanced as the miking-distance increases (albeit with more room-sound pickup and some loss of warmth where directional mics have been used). Of course, whether that kind of fidelity is your ultimate artistic goal is a whole separate question! Combatting Spotlighting With Refectors: In a dry acoustic, wooden-bodied instruments can sound rather lifeless and unnatural if miked very close, as in the case of this acoustic-guitar recording (Ex06.051:WAV/MP3 ). Where such close-miking is unavoidable, adding reflective surfaces around the instrument to bounce more of its entire frequency dispersion into the microphone can help to revive the timbre (Ex06.052:WAV/MP3 ). Off-axis Tonality Of Budget Large-diaphragm Cardioid Condenser Mics: To illustrate the off-axis response vagaries of typical budget large-diaphragm cardioid condenser mics, I've recorded the same vocal phrase from five different angles around the same microphone (a mass-produced Groove Tubes GT57 operating in its cardioid mode) and then roughly matched the subjective loudness of the resulting files so that you can concentrate on the tonal changes. The miking distance in each case was identical, and the miking angles I used were: 0 degrees, ie. on-axis (Ex06.053:WAV/MP3 ); 30 degrees off-axis (Ex06.054:WAV/MP3 ); 90 degrees off-axis (Ex06.055:WAV/MP3 ); 135 degrees off-axis (Ex06.056:WAV/MP3 ); and 180 degrees off-axis, ie. directly in the cardioid polar pattern's rear rejection null (Ex06.057:WAV/MP3 ). Mic Shootout -- Acoustic Guitar: Here's a shootout of eight classic microphones on three different acoustic guitars: a Taylor ('Guitar 1'); an Art & Luthiere ('Guitar 2'); and a Huss & Dalton ('Guitar 3'). The mics were set up in a tight pattern roughly 45cm in front of the guitar, pointing at the instrument's 12th fret, and all mics were recorded simultaneously for each guitar. Mic Shootout -- Electric Guitar: This shootout showcases five different microphone designs capturing a single electric guitar cabinet. The mics were set up in a tight pattern roughly 15cm from the grille of a Fender Twin Reverb guitar amp, pointing at the centre of the left-hand speaker cone. All the mics were recorded simultaneously. Mic Shootout -- Snare Drum: This shootout features seven classic microphones capturing the sound of three different snare drums: an Orange County 14x5-inch maple snare ('Snare 1'), a Ludwig Black Beauty 14x5-inch hammered brass snare ('Snare 2') and a deeper Gretsch 14x6.5-inch mahogany snare ('Snare 3'). Five of the mics were set up in a tight pattern over the rim of the snare at a distance of roughly 15cm from the drum, while the other two mics were in a tight pattern roughly 15cm from the underside of the rim. In both cases the mics were pointing at a spot halfway between the centre and the edge of the head, and all mics were recorded simultaneously for each drum. Mic Shootout -- Kick Drum: This shootout demonstrates the sound of six classic kick-drum microphones on a single drum. The mics were set up in a tight pattern roughly 45cm outside the front of a kick drum with a resonant head (with a small hole cut in it), and all the mics were recorded simultaneously. Equalisation: If you want to get up to speed with the fundamental principles and applications of equalisers for recording purposes, then check out this pair of fairly user-friendly explanatory articles from Sound On Sound magazine: 'Equalisers Explained ' and 'Using Equalisation'. Drum Tuning & Damping Techniques: This useful little Sound On Sound magazine article is specifically aimed at small-studio engineers: 'Engineer's Guide To Tuning & Damping Drums'. DIY Guitar Isolation Cabinets: If you're interested in pursuing this option for recording electric guitars on the quiet, then here are a few Youtube tutorials to whet your appetite: Video 1; Video 2; Video 3.